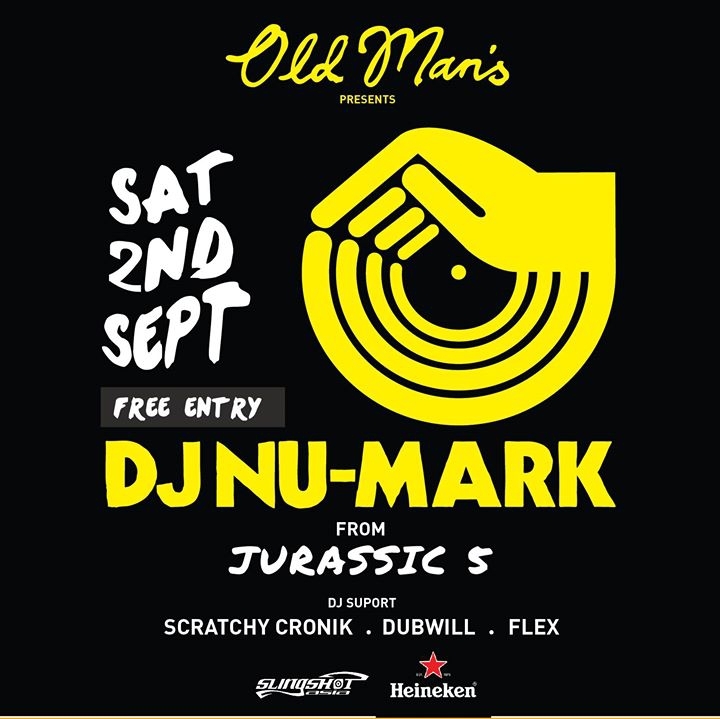 DJ NU-Mark from Jurassic 5 will be joining us for a FREE event at Old Man’s on Saturday 2nd September. As an original member of the critically acclaimed, gold-selling Hip-Hop outfit, Jurassic 5, DJ Nu-Mark graced the group with precision production and cutting edge stage routines. Best known for his production on the raw anthem “What’s Golden.” Today Nu-Mark has completed a collaborative album with Slimkid3 of Pharcyde on Delicious Vinyl which featured songs that include Murs, Del, Diamond D, Darondo and J-Live. The Slimkid3 & DJ Nu-Mark collaborative LP recently shot tonumber 1 on the CMJ charts in the U.S.! Nu-Mark began DJing at the age of 13 in Los Angeles. Over the last two decades, he has amassed an immense collection of rare records from around the world. Nu-Mark’s refined music production and live showmanship regard him as one of the most innovative DJ’s in music culture. As a original member of the critically acclaimed, gold-selling Hip-Hop outfit, Jurassic 5, DJ Nu-Mark graced the group with precision production and cutting edge stage routines. Best known for his production on the raw anthem “What’s Golden” such creativity only hinted at his imagination since Jurassic 5’s breakup in 2006. In 2013, J5 reunited with a staggering performance at Coachella which featured a gigantic turntable designed and manipulated by Nu-Mark. Nu introduced himself as a solo artist in 2004 with Blend Crafters, an instrumental EP created in the spirit of allowing beats to speak for themselves. Later that year Hands On, was released as a mix CD that featured Mc’s rhyming in different languages from around the world. He has remixed songs for Nas & Damian Marley, created tracks for Saturday Night Live’s Lonely Island and constructed the Tropical Funk mix Take Me With You. Most significantly, after more than three years of brainstorming, experimenting and collaborating, he’s released his critically acclaimed debut album Broken Sunlight, which reveals his influences and innovations into a jaw dropping collection of heart felt music featuring Aloe Blacc, Charles Bradley, Quantic, Large Professor, Bumpy Knuckles, A-Skillz, Tiron & Ayomari and J-Live. Recently Nu-Mark has been widely recognized for filling his entire stage with children’s music toys and playing them as instruments. This Kids Toy Set went viral when Nu-Mark compiled his performances from around the world in his DVD Nu-Conduit. To date, Nu-Mark has been featured in the critically acclaimed documentaries Scratch, KeepinTime, Coachella: The Movie, Rock the Bells – The Documentary and MacGrubber. In 2013 Nu-Mark created original beats and co-scored both Battle Of The Year starring Chris Brown and Ride Along staring Ice Cube and Kevin Hart. Today Nu-Mark has completed a collaborative album with Slimkid3 of Pharcyde on Delicious Vinyl which featured songs that include Murs, Del, Diamond D, Darondo and J-Live. The Slimkid3 & DJ Nu-Mark collaborative LP recently shot to number 1 on the CMJ charts in the U.S.!